The second episode of Doctor Who season 11, "The Ghost Monument," saw the Doctor and her friends stranded on an alien world with two unlikely (and distinctly uneasy) allies. It was a tremendous episode, building up to a satisfying climax where the Doctor changed the rules of a cosmic race and ultimately regained her precious TARDIS. New showrunner Chris Chibnall has promised that season 11 will return to a more episodic format, but it's already becoming clear that certain key themes and ideas are running through the season. The most notable of these is that of "family," a theme that was central to the premiere and became important in this episode as well. That said, Chibnall's approach to the season-wide themes seems to be a lot more natural than previous showrunner Steven Moffat; they're developing quite organically, and it will be fascinating to see how they develop next week. 10. Does The New TARDIS Live Up To The Hype? A TARDIS redesign has become something of a tradition for Doctor Who; every new Doctor seems to get a brand new TARDIS. Given that season 11 is essentially a relaunch of the BBC's longest-lived science-fiction TV series, the revelation of the new TARDIS was always going to be important. This reveal was saved it for the end of the second episode, and then took its time, allowing viewers to explore the new TARDIS interior for the first time. Everything was seen through the prism of the delighted Doctor, encouraging audiences to fall in love with the TARDIS just like the Doctor was. This new TARDIS is a dramatic change from any version we've seen before. The entrance is reminiscent of Paul McGann's, the orange glow of David Tennant's. But, in general, it's far more atmospheric than before, and is frankly almost imposing. There are strange giant crystals, shifting trans-dimensional walls, and mysterious shimmering viewscreens. As always, the console itself is a mess, with everything from buttons and levers to sand-timers and even a spinning TARDIS model. It's going to take some getting used to; previous seasons have released virtual tours of the latest TARDISes, and hopefully the BBC will do the same here. 9. Why Was The TARDIS Out Of Phase? The Doctor's regenerations have become increasingly spectacular since the series was revived back in 2005, but Peter Capaldi's appears to have done more damage to the TARDIS than any we've seen before. The burst of regeneration energy seared the interior of the craft, and did enough damage to send the TARDIS spinning off through space and time. For some reason the TARDIS became anchored to a single planet (more on that later), but it was still out of phase - apparently half-materializing once every thousand years, thus earning the title "The Ghost Monument." 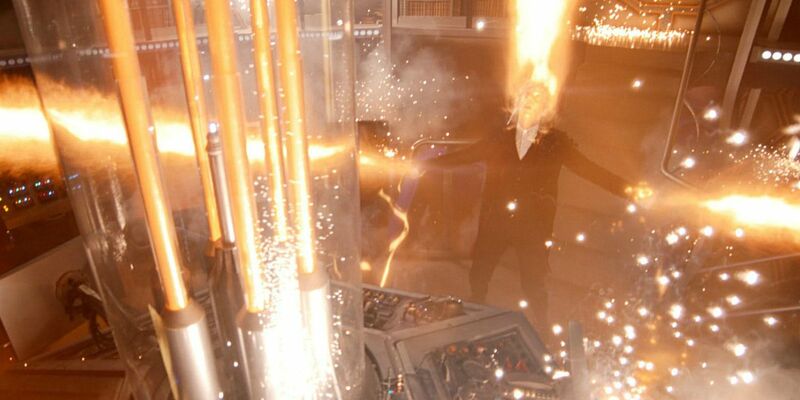 We've never seen a regeneration do quite this much damage to the TARDIS before. What was different, and why did the TARDIS get stuck out of phase for so long? 8. Why Did The TARDIS Dump The Doctor On Earth, And Wind Up On Desolation? Given the extent of the damage the TARDIS suffered, we can assume that it dropped the Doctor off on his/her favorite planet so as to keep him/her safe. But that being done, why did the TARDIS then head away from Earth to a star system 5,000 galaxies away? Why did it become anchored to Desolation, to the extent that even though the planet's orbit was shifted it still materialized on the surface? Perhaps the answer is that the TARDIS was so badly damaged it got to Earth and ejected the Doctor, before spiraling out of control, heading off to anywhere and anywhen. It's doubtful that season 11 will ever really address this mystery, so that's probably the best explanation we'll ever get. 7. Who Is The Timeless Child? This is definitely one of the biggest mysteries of the episode. In one scene, the monstrous Remnants - dangerous ribbon-creatures - attempt to frighten the Doctor by peering into her mind. They do a surprisingly good job, speaking of a mystery that lies in the Doctor's past. "We see deeper though, further back," the Remnants whisper. "The Timeless Child… we see what’s hidden, even from yourself. The outcast, abandoned and unknown…"
There's no way a line that isn't setup for something big later on in the season. But who is this mysterious Timeless Child? The top possibility is that it's the Doctor herself, with an aspect of her personal history repressed and forgotten. Another option, given themes of family are important in season 11, is that they're referencing the Doctor's parents - or even her children.